The R used to be my winter beater, but since I'm moving down in the world, the R is now my "good" car. 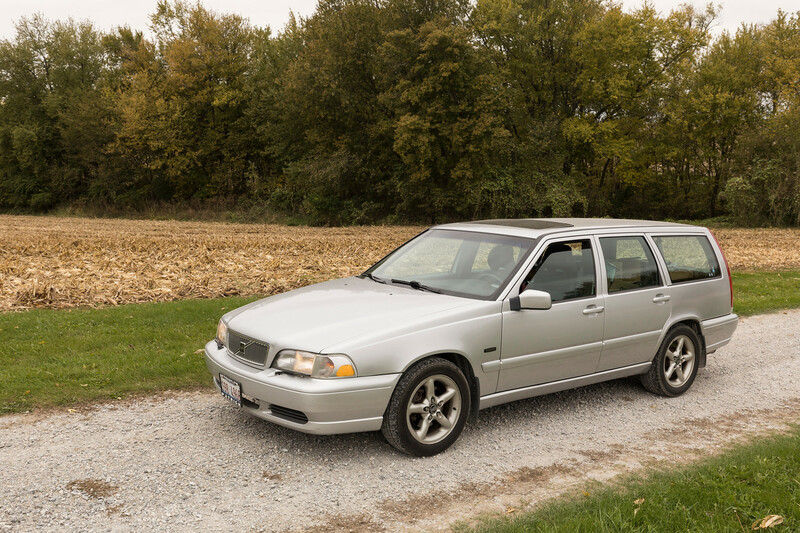 I acquired this 1998 V70 AWD from a family member to be my new winter beater Just had its fuel pump replaced at the dealer to the tune of $2,000. 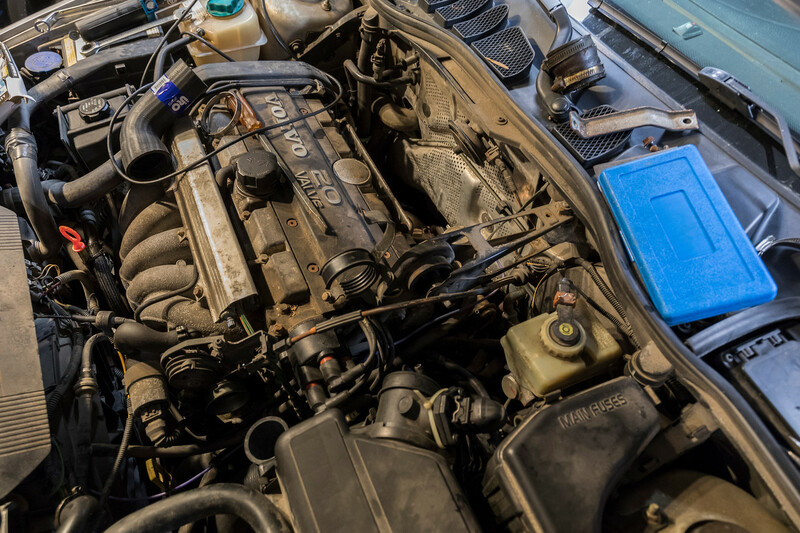 The car smokes a lot and uses oil but otherwise drives fine. 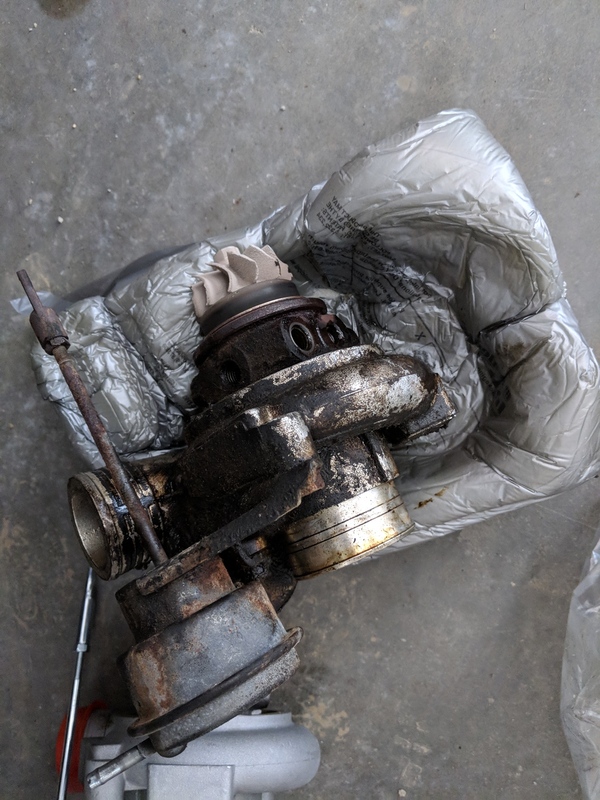 Dealer diagnosed it as needing a new turbo. I believe their diagnosis is probably correct based on my experiences with it. The car has 180,000 miles on it. 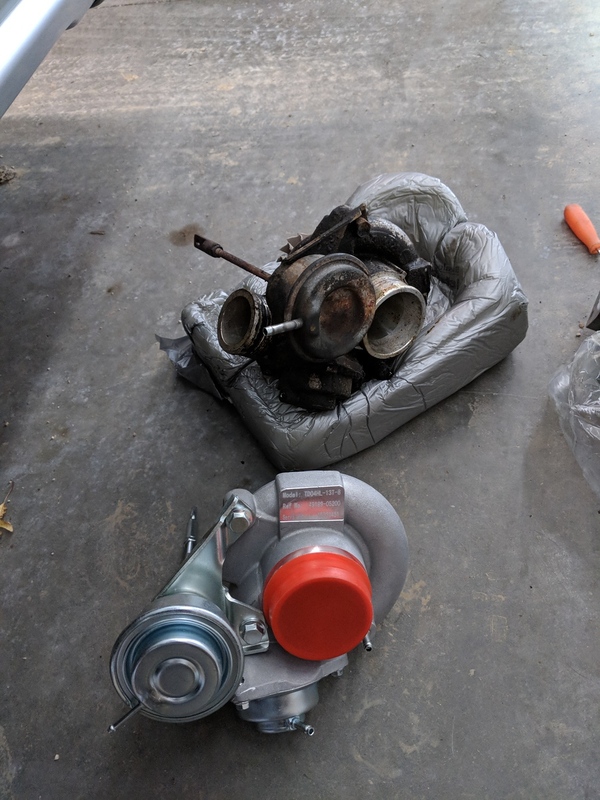 I bought a ChinaBay turbo to slap on it. I pray it's halfway decent since this job is just a PITA! I got as far as getting the new turbo on and the plumbing hooked up this weekend. 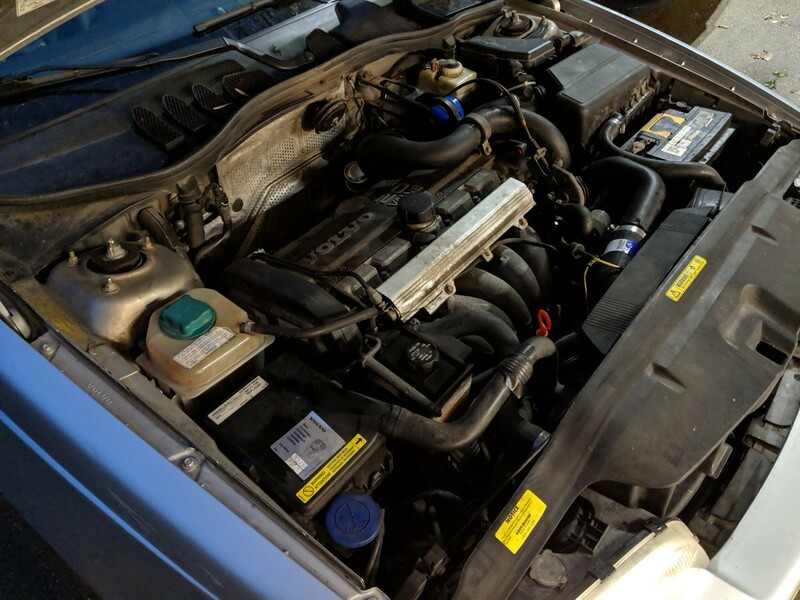 I'm also replacing all the intercooler hoses with URO crap hoses. Vacuum lines are getting replaced with silicone lines. The top torque mount is busted so I'll probably stick a poly one in. The sunroof doesn't work but that can wait till the spring. The body is pretty straight. Interior has all the usual issues the cars suffer from. IPD poly mount installed. 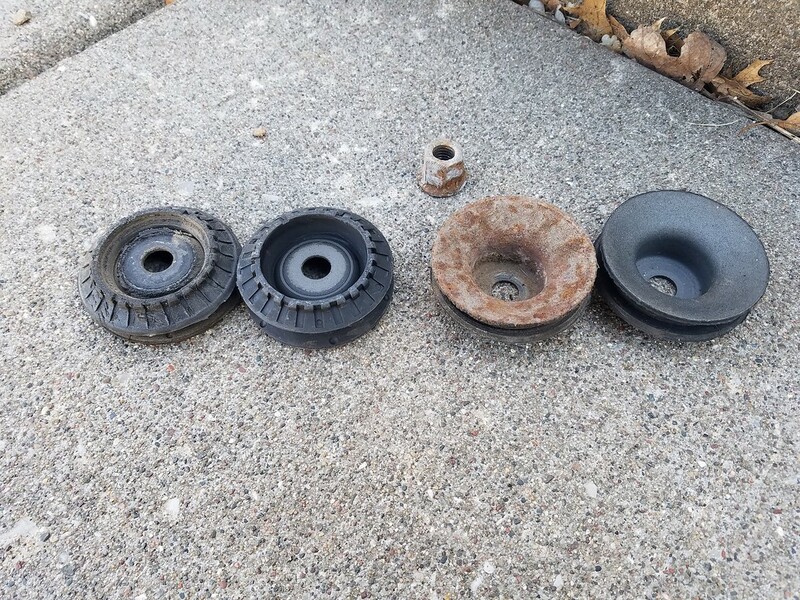 The old mount came out in pieces. 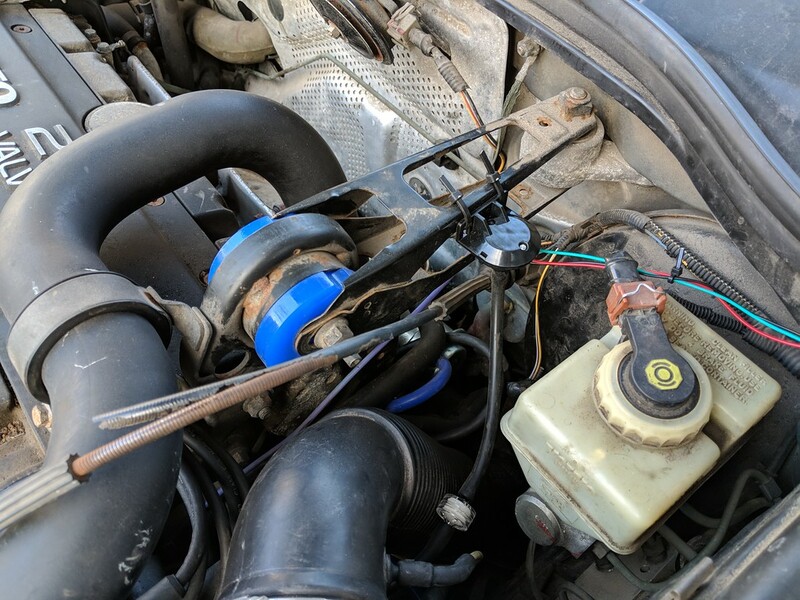 Turbo installed with all the plumbing connected. I struggled a long time with the far oil drain line bolt. Together enough for a test drive. No more plumes of smoke upon start up or when in boost. Hopefully the chinese turbo lasts as long as I own this car. I still have to install the heat shields. 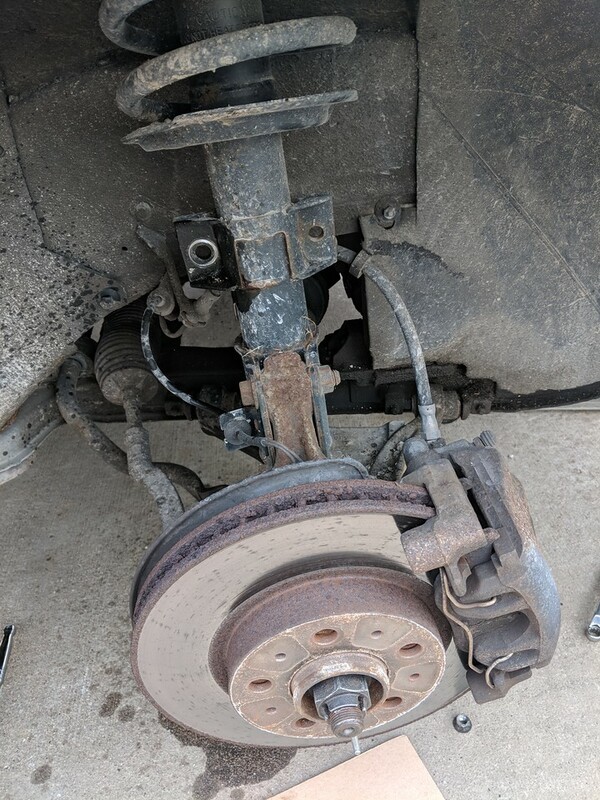 My new problem is a clunk from the rear right side. I'm guessing new sway bar end links are my next purchase. That should be a fun winter beater. 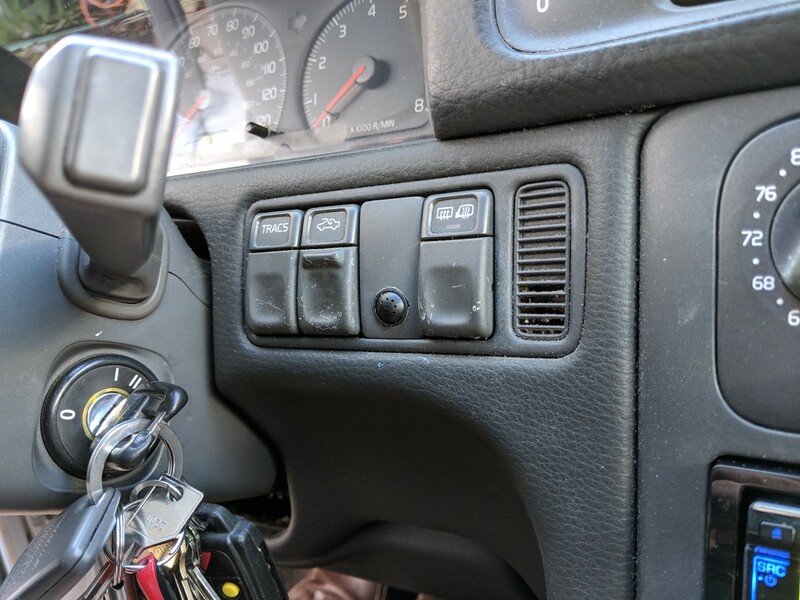 This weekend I'll hopefully get the trans fluid flushed and replace some of the burned out dash bulbs. I still need to get under the rear end and find that noise. 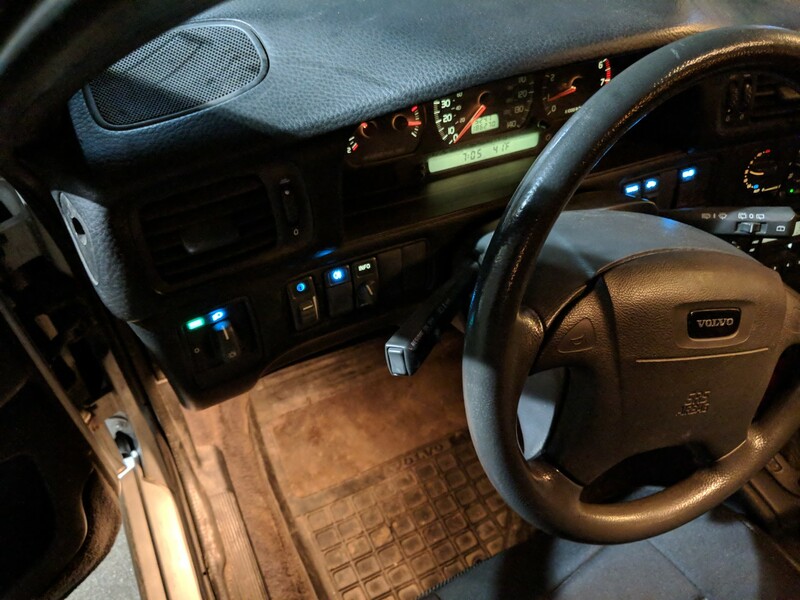 I replaced some of the burnt out instrument switch bulbs with LED T3 neo-wedge bulbs. They're supposed to be white but look more blue to me. They are very bright, but the bases are junk. I actually moved LED's into the burnt out bulbs bases for a better fit. Now that it's dark when I leave work, I've found the halogen headlamps unacceptable. Hid headlights have spoiled me. 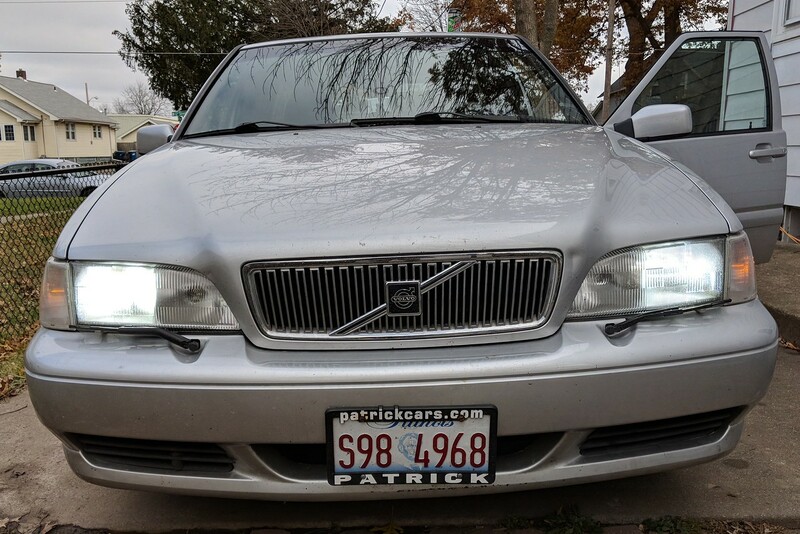 I installed a pair of LED headlights in the V70... Yuuggge improvement. I had to bend the retaining bracket a bit to get them in but they do clear the dust caps. I found water in the rear cargo area after a rain. Next step is to remove the euro rail cover and look at the plugs. I think I found a solution. 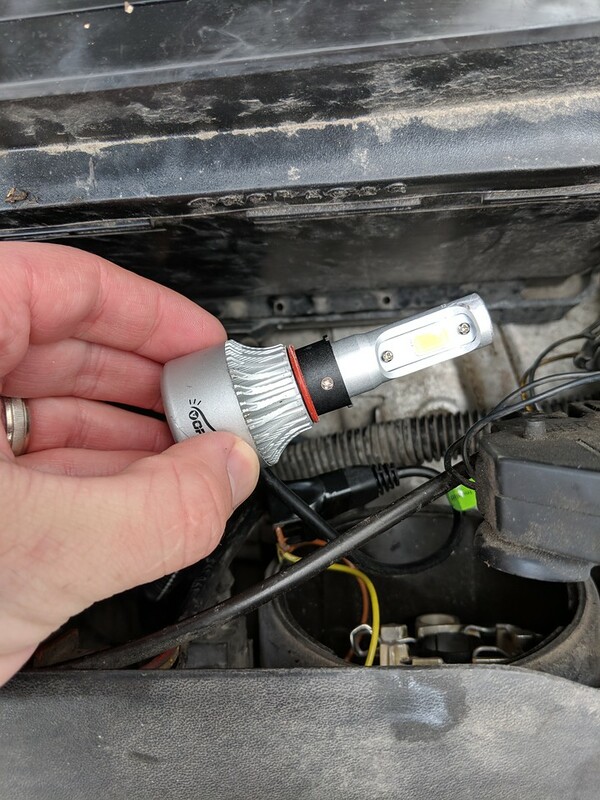 I tried the same sellers "warm white" T3 bulbs. These are a much closer match to the dim glow of the factory lights. 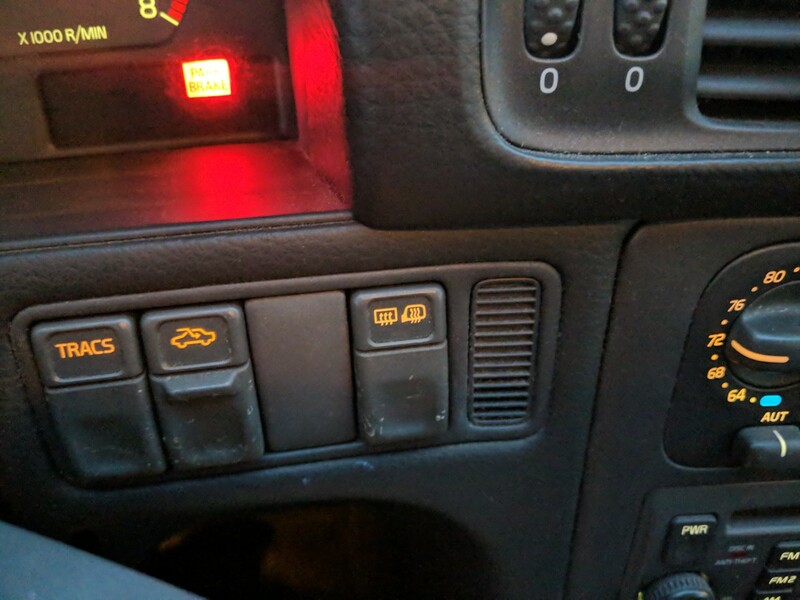 The climate control box is still running the factory bulbs, but the those three switches have warm white leds in them. Pretty good match I think. I'm still chasing down sounds. I did note the rear tailgate fairly is loose when closed. 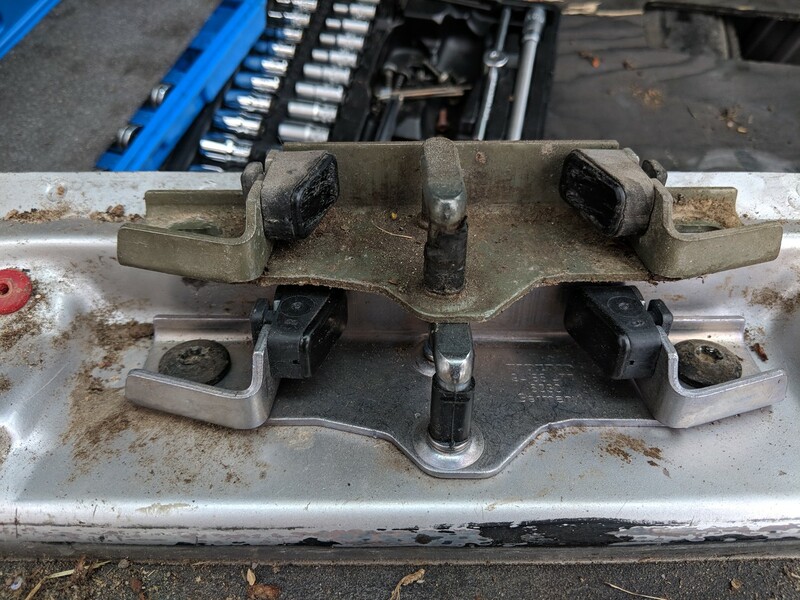 I decided the existing latch anchor looked pretty banged up and decided to start by replacing it. Strangely, tasca was selling them for $22. You can see that black plastic piece is crumbling away and the pads look less beefy on the old one. The tailgate is no longer loose and the rear of the car is much quieter. Now I have a squeak/rubbing sound coming from the front of the car to figure out. 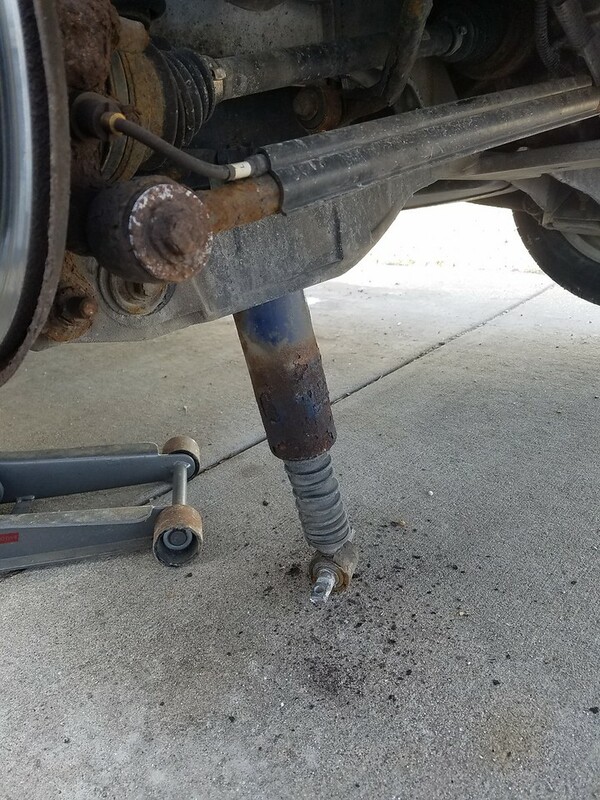 The car has new front strut assemblies but probably not much else. Nice fix! Hope the noise hunt continues successfully! 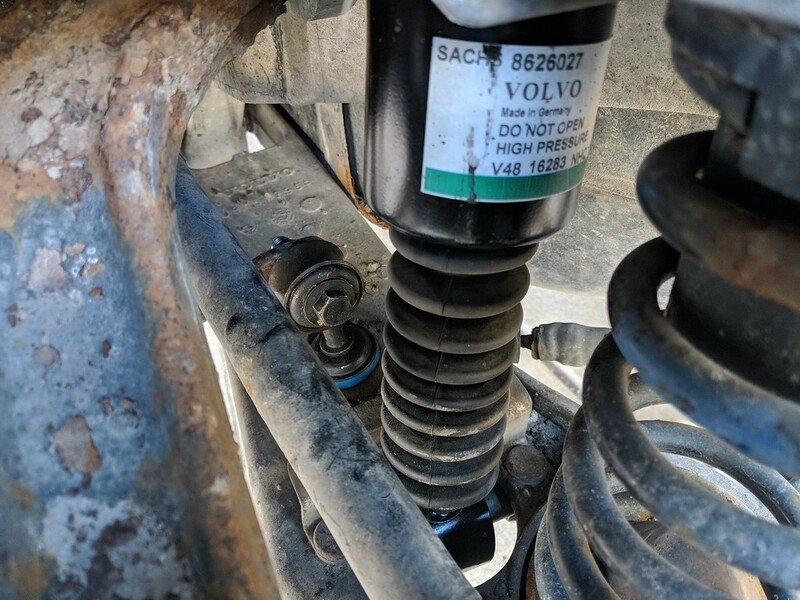 I replaced the front sway bar end links. They did not want to come off easily. 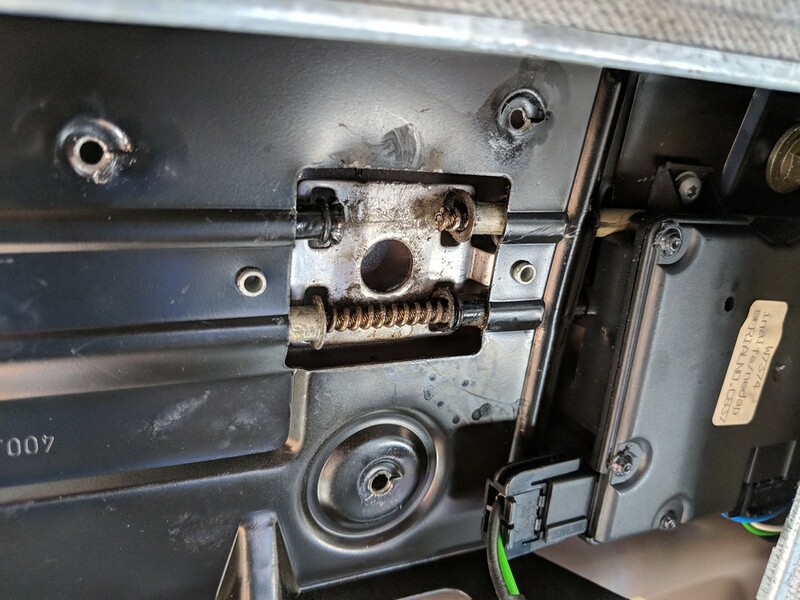 A T30 socket was the first casualty of this car. Converted the brights to LED as well. I was able to fix the leak in the cargo area. 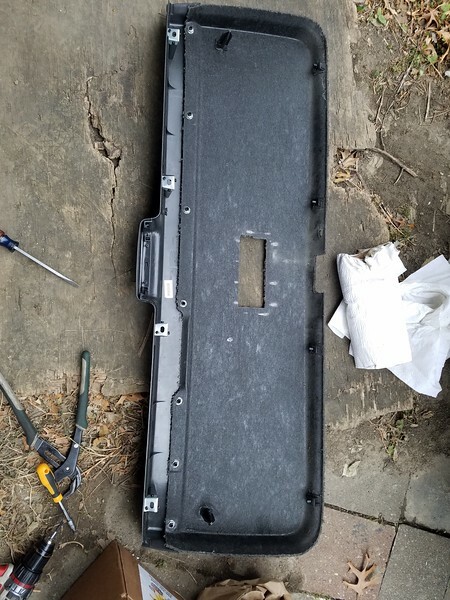 It turns out of the bolt holes for the load bars was uncovered. From what I read online there should have been a bolt+rubber grommet there. 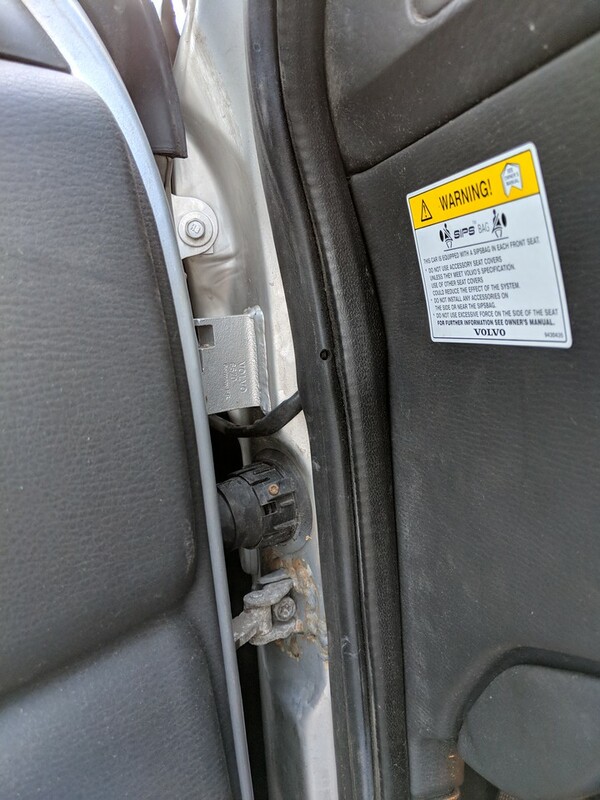 I put a bolt in with a dab of window sealant. No leaks so far! I'm still chasing sounds. I know my squeak sound is due to the tailgate panel being lose. The holes where the clips used to go seem to be broken. The best solution is to find a panel in better shape. The other sound is a hollow knock from the rear drivers side when going over bumpy roads. It almost sounds like something banging on a hollow tube. I can't hear it at all with the windows up. 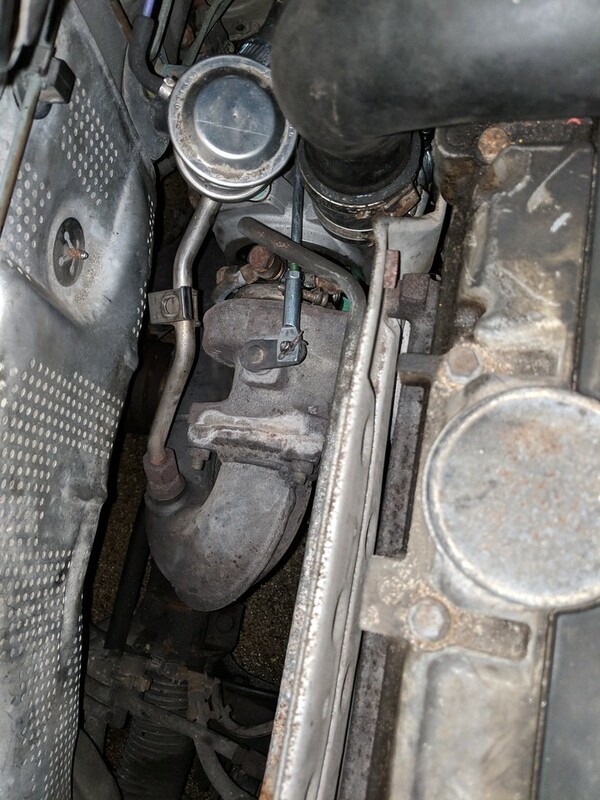 I initially thought it was due to a sagging exhaust hanger that allowed the muffler to bang on the subframe, but fixing that issue didn't make the sound go away. All the body trim feels firmly attached. 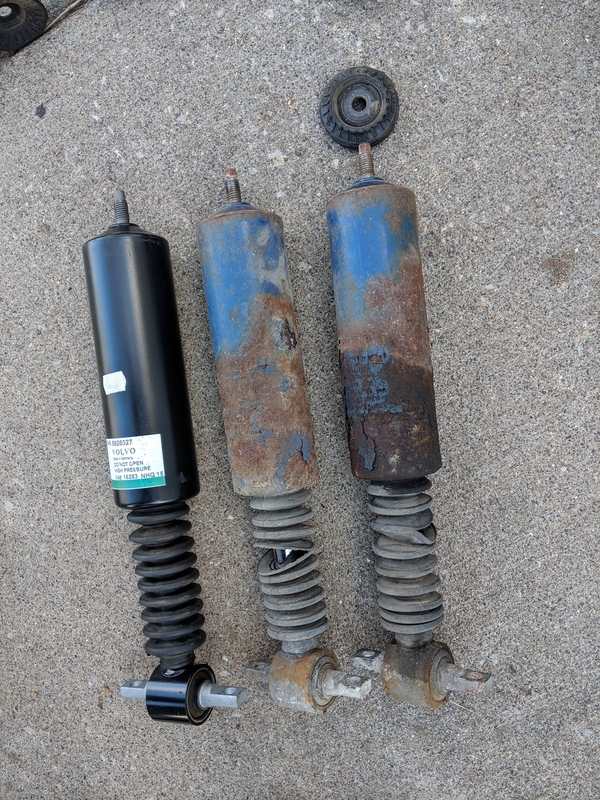 I can't find anything that feels loose in the rear suspension either. 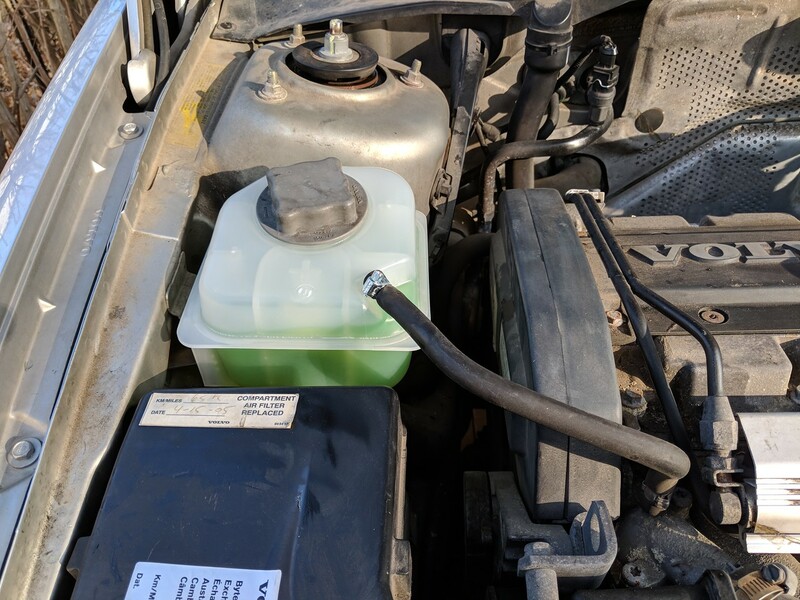 I found coolant on the outside of the overflow tank, which led to me noticing tiny cracks in the cap for the tank. 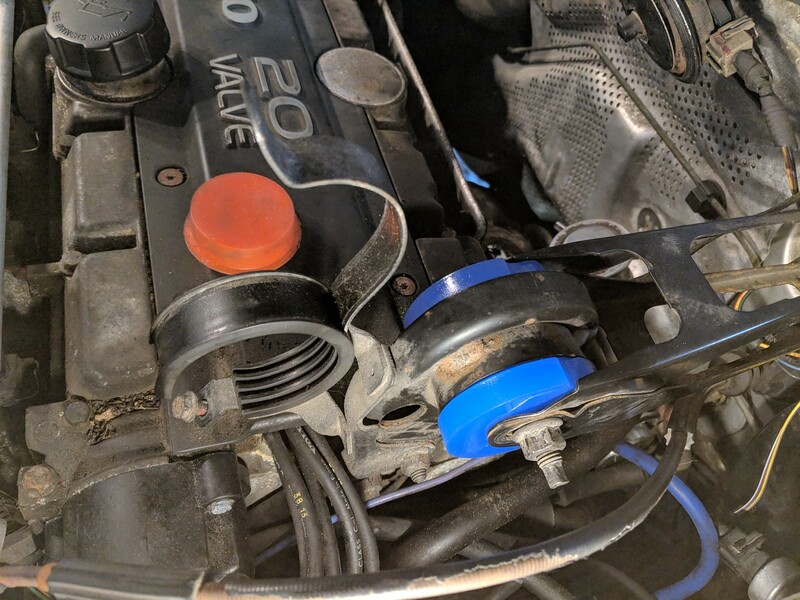 Luckily, I have many spare volvo coolant caps. 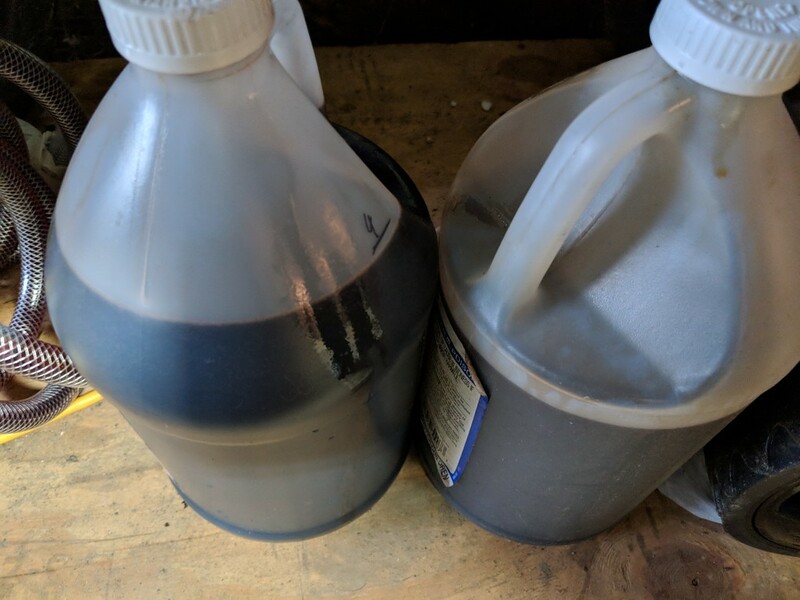 I bought a new overflow tank to replace the one that's there. I don't want to take any chances with it. Dumped seafoam in the crankcase and let the motor inhale some before the first oil change. A huge smoke show ensued. I have noticed some smoking coming out of the dipstick at idle. I've debated replacing the PCV system, but I remember doing so didn't fix this issue with my previous two P80 models. It's a huge PITA to replace on these cars so I guess I'll live with it for now. 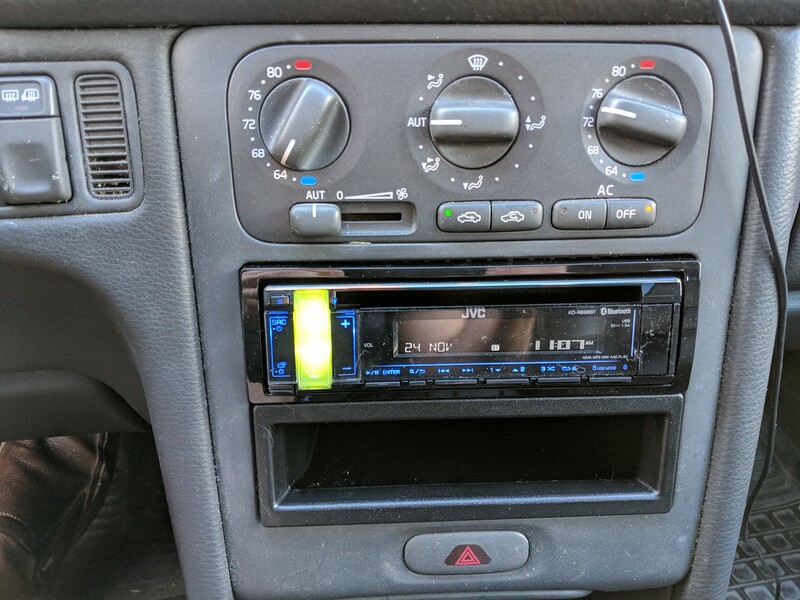 I did decide I wanted bluetooth phone/audio streaming so I put a different HU in the car. Wow-that's a lot of keys! Yeah. Three Volvo fobs, one Volvo key, one garage key, two house keys, two work keys, one work fob and a flash drive. Only got very minor stuff done. 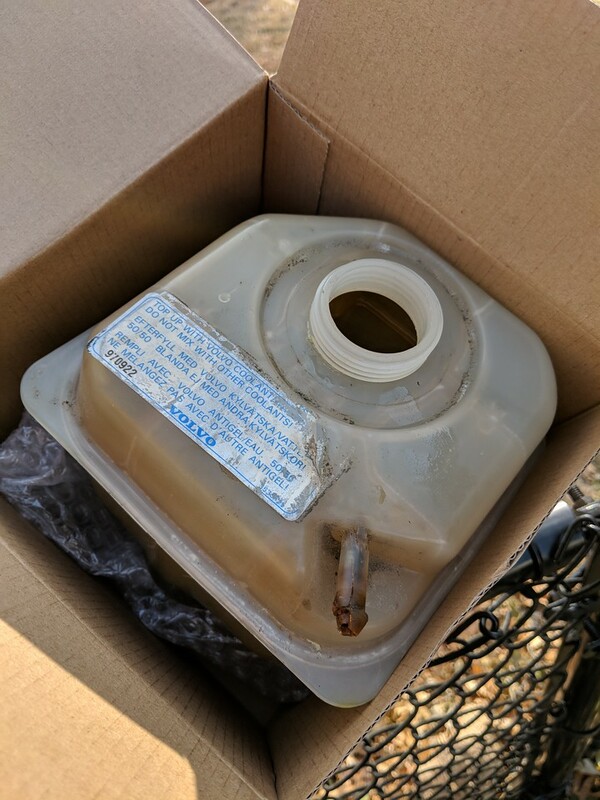 I saw some dried coolant on top of the coolant reservoir. I noticed the cap had tiny cracks on top so I replaced the reservoir with the new one and found an old cap in my parts collection. I've been loading the rear suspension parts canon but haven't had time to even get under there. 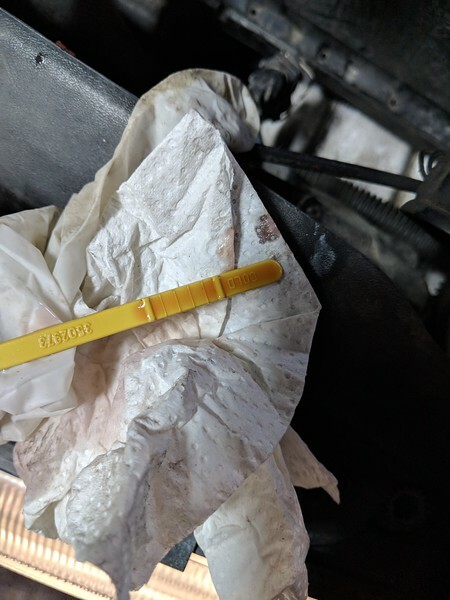 Turns out the car had a anti-rattle kit previously installed, but a lot of plastic bits were broken. I thought the rear wiper motor ran sort of slowly. I bought a used one on ebay that only ran for a second or two before groaning to a stop. The original went right back in. The tailgate lock was continually giving me issues. The colder it gets, the less likely it is to latch. I found hitting it with heat to be the only way to get it to latch when it's near 0. I ended up replacing it with a JY unit. That seems to have done the trick so far. 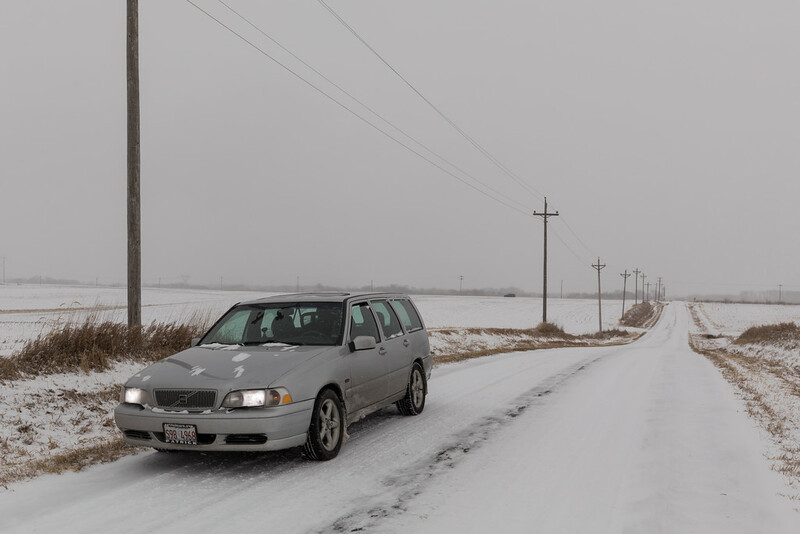 Winter beater enjoying winter. I forgot how annoying TRACS is on these models. 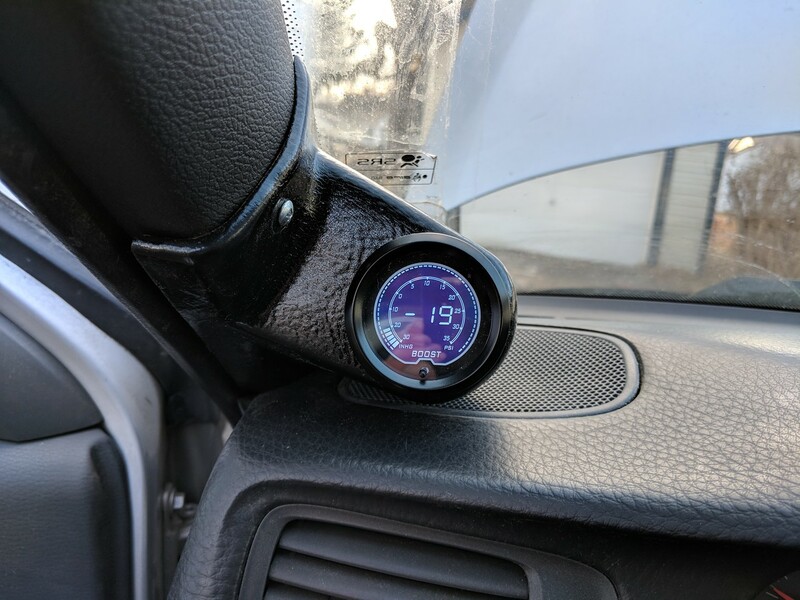 I installed a cheap boost gauge in the car since Volvo provides no way to monitor boost levels. 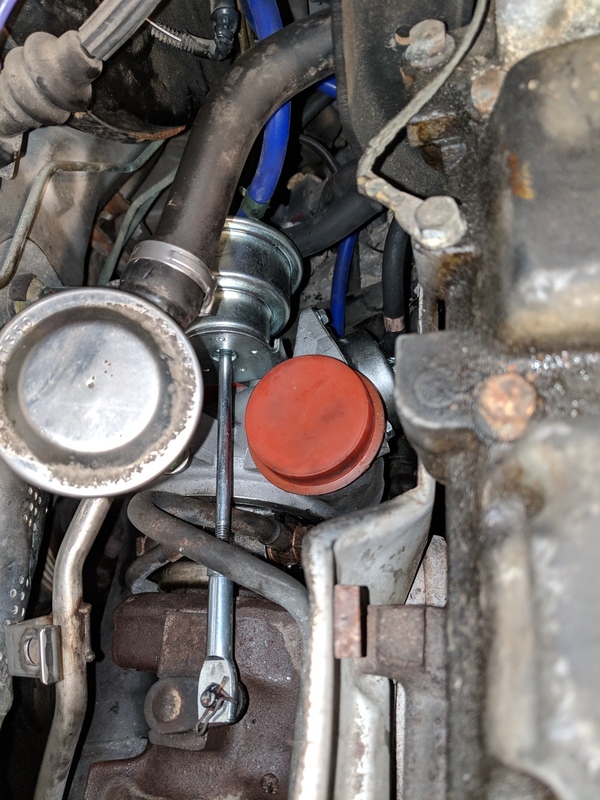 I didn't see any great places to mount the sensor so I put it on the torque rod. Routed the wiring through the front fender and then down into the dash through the side. You can see where someone welded the door hinge. 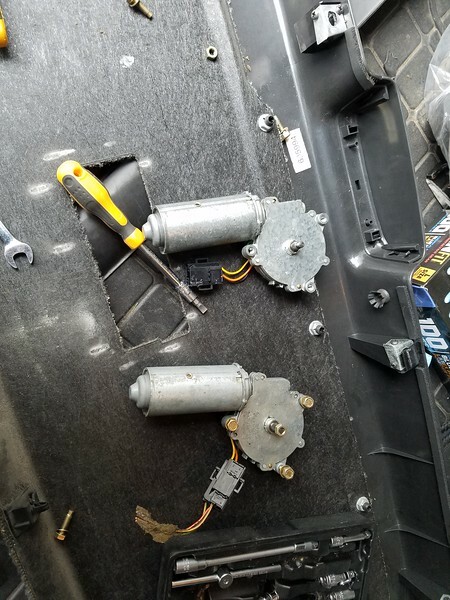 IIRC these cars have an issue that causes the door hinges fail and cause the door to make popping sounds over time. I assume that's what the welds were for. Former Ipd pod gauge from my old 850. 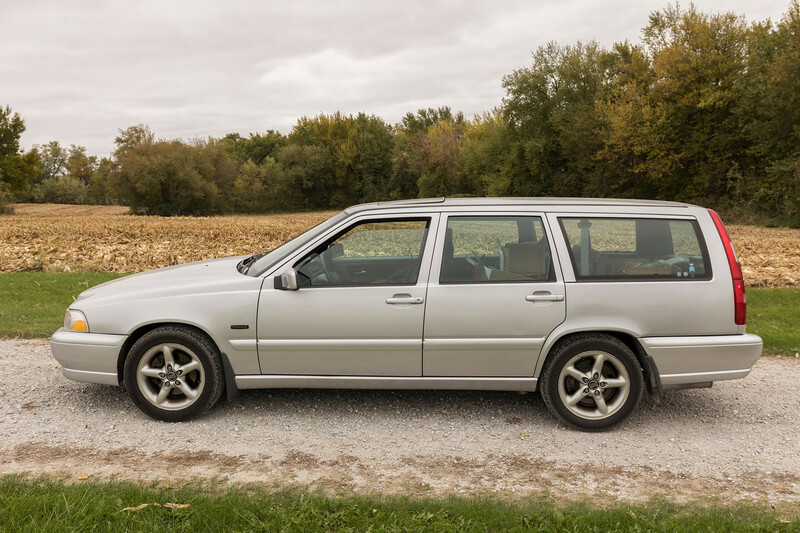 Fits the V70 pretty well. Looks good, toss a little black paint on that screw head for full errection. 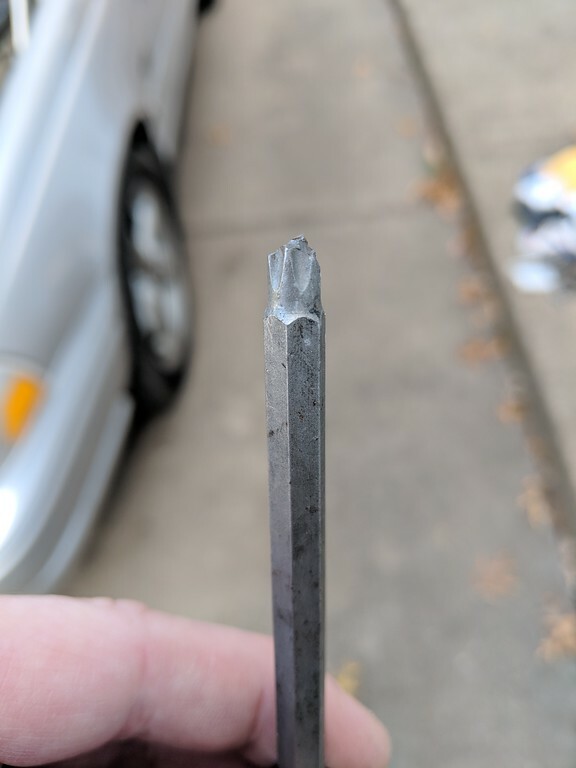 I decided to investigate why the sunroof isn't working. Motor does seem to work. The cable running along the passenger side is completely stuck though. 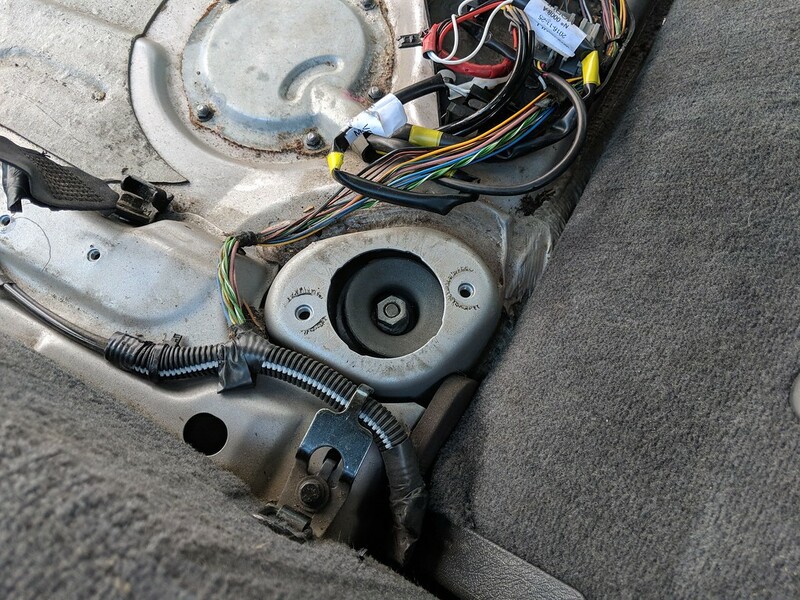 It sounds like it would be cheaper to replace the entire sunroof assembly with a JY unit than to replace the cable. The sunroof is now currently stuck in the vent position. 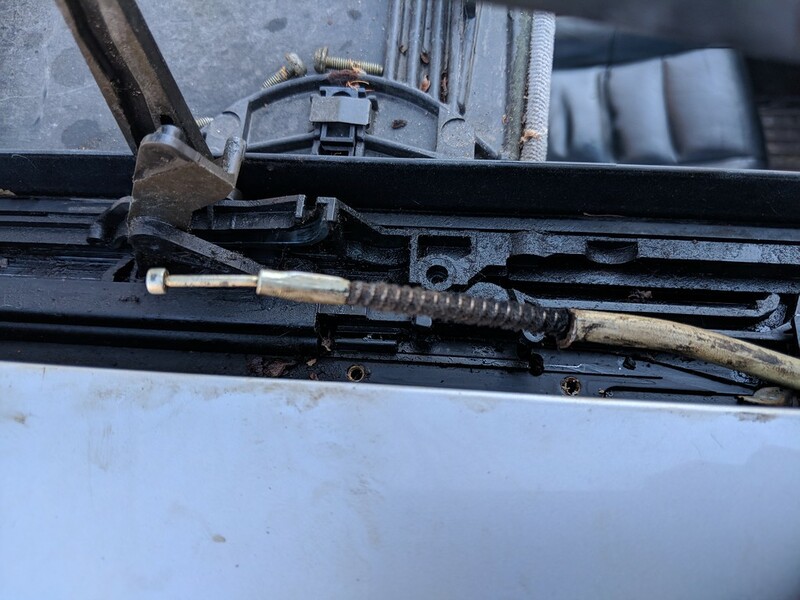 I'm hoping that if I disconnect the cable from that side tomorrow I can at least get the sunroof closed. Got the roof closed. 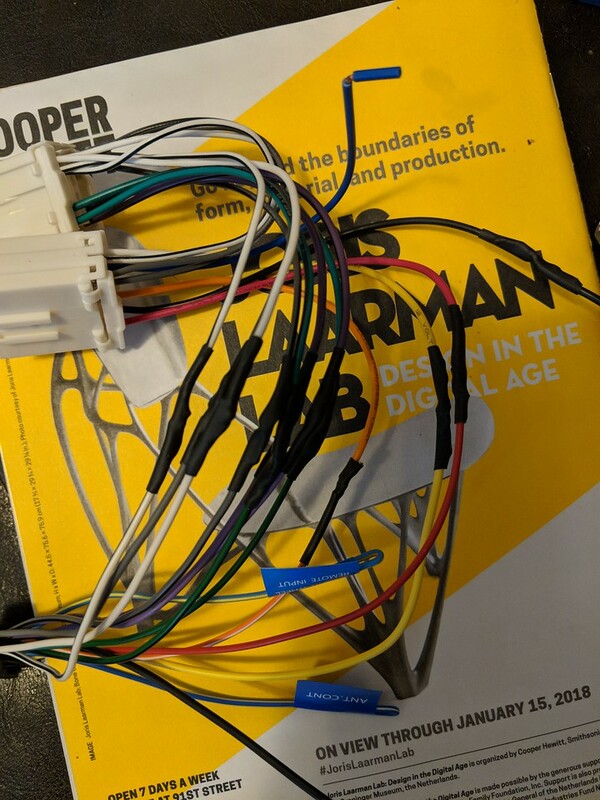 I cut out a section of the cable for now. That will at least allow me to vent the sunroof until I find a used assembly. Today I installed a pair of lightly used Nivomats. I've noted that the installed ones look pretty sad. The old one drops down once the top bolt goes. The car has to be jacked up pretty high to wiggle these out. One of the newer ones next to the originals. The original set looks like it has had a hard life. It seems like the drivers side one (the one that appears to leak) was taking longer than the passenger side one to level. These little bushings run $65-80 a piece. 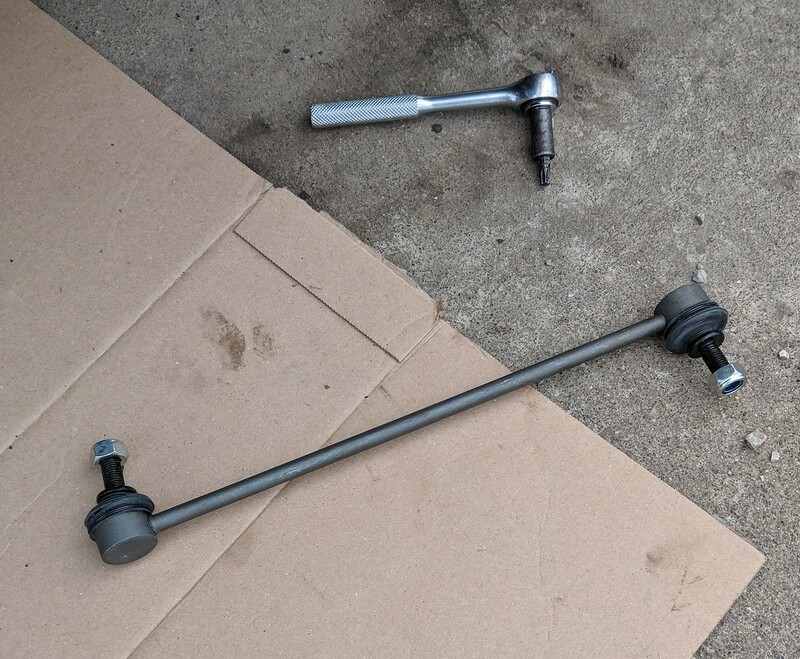 With the nivomats out I had easier access to the swaybar end links so I replaced those. The top bushing before lowering the car for the final tightening. 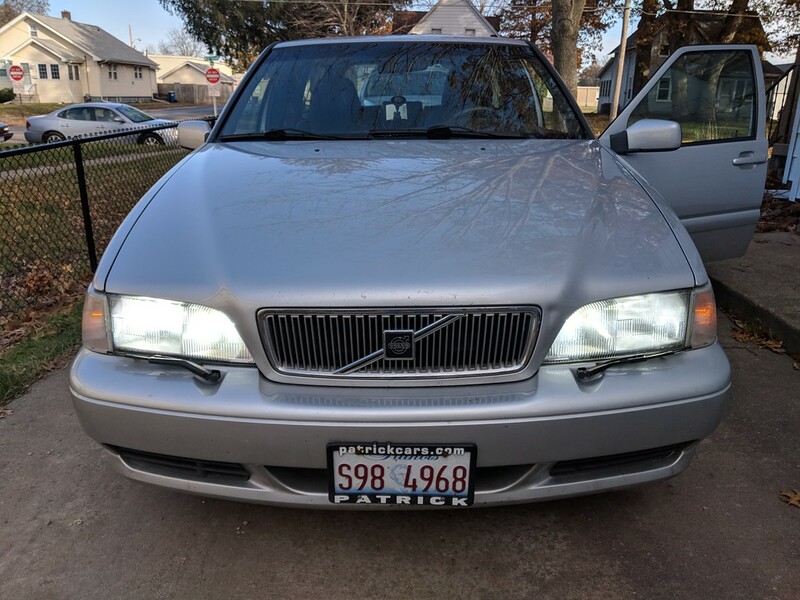 I still have a clank/clunk sound that's coming from the drivers side of the car when driving on rough roads. 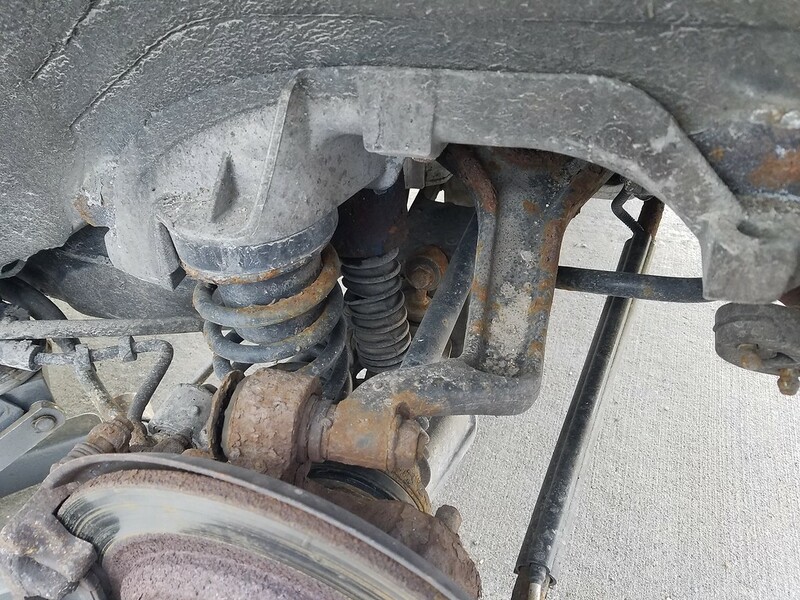 I'm starting to wonder if it's from the bump stop that's sitting loose in the spring coil.